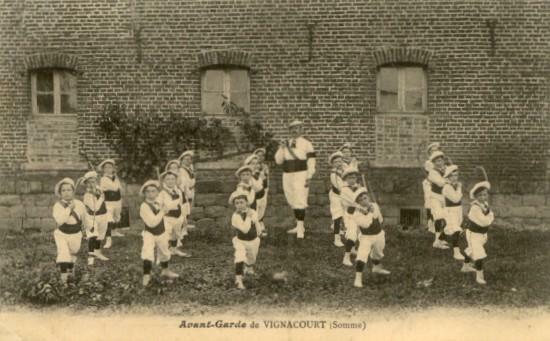 The friendship association of former pupils of Vignacourt boys school was created on 24th July 1908. The goal was education, culture and Sports. 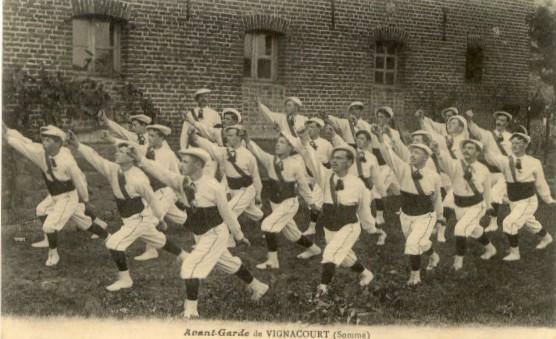 The vanguard of Vignacourt emerged before the 1st world war. It was created exactly the 18 May 1911. It was dedicated to the gymnastics, shootout and sports. Sports federations developed in France in the early 1900s. The kind of associations were also created in other villages. The friendship association of former pupils of Vignacourt girls school was created on 11th June 1914. The goal was education, culture. The official date of the creation of the fraternel association of the veterans, mutilated and war widows was on 27 december 1929 and remains active to date. The sporting commitee "Union Sportive"
The sporting commitee "Union sportive" was created after the 2nd world war, the exact date was 22th May 1945. The goal of this association was the physical education and football. The head office address was located in a coffee-shop : Coffee Brailly, in the Godard Dubuc street..
Union of towards those affected by the war, the victims (More the disaster for the home, mainly, IMHO), on 28 August 1945.